Tops are rugged 3/4" flake board and covered with a handsome, high pressure walnut laminate. 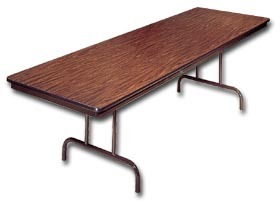 This durable folding table is the standard for function and quality. Top/Paint finishes available in Walnut/Brown, Light Oak/Brown, Gray/Gray, Gray Nebula/Black - Please Specify. Strong legs are 1-1/4" and made from 16 and 18 ga. steel. FOB Shipping Point. Product No. Size W x L Wt. (lbs.) Ctn. Price Ea.